New free tool (fling) from VMware labs now allows to manage ESXi host via web client without the need of vCenter server. ESXi Free Web client interface (HTML 5 based) allows to manage a host without the need of the legacy C++ Windows client. The utility is bundled as a vib and can be installed on ESXi host via SSH (via Putty for example) without the need to reboot the host. Update: The ESXi Host Client is part of ESXi 6.0 Update 2 now !!! No need to do any installation. It's embedded into the Installation ISO. The tool is in It's early stage of development and not all the features and functions are present yet. But nice work VMware. Big congratz to all engineers who works on this! Etienne Le Sueur et George Estebe. They say – Don't hesitate to provide feedback. How to install the vib? The web client for ESXi is a vib. A vib is vSphere Installation Bundle. 1. Connect to your host via legacy vSphere C++ client and upload the vib to a local datastore. Here is a view on the properties of a VM. I haven't found an option to change virtual hardware version. Probably not just implemented yet…. Pretty much all modern browsers like Chrome, Firefox, Opera, Safari or IE (on Windows) works. Check the ESXi embedded host client's page for all details. The product is easy to use, install and uninstall. To uninstall, simply use the same command, but with the remove switch. You're done. 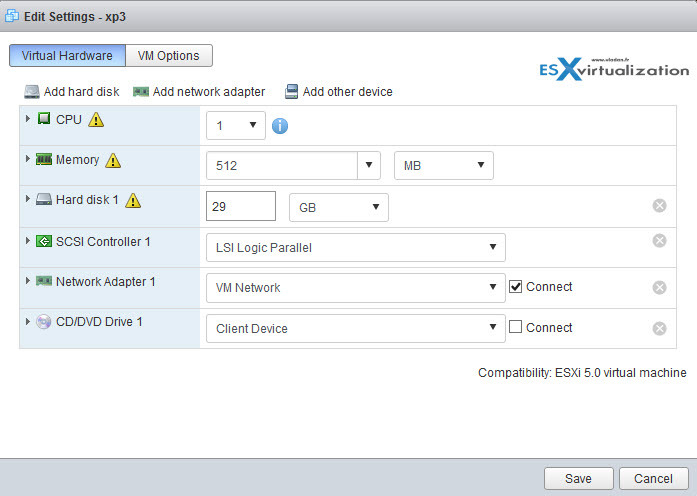 Now you can Install or remove a ESXi FREE Web Client Interface to any host. The tool is intended to be used for standalone hosts as hosts managed via vCenter server do have their own vSphere web client (flash based for now). New Updates in v5.0 !! On ESXi hosts which are assigned a VMware vSphere Hypervisor license (Free license) , all modification operations will fail silently. We are working on a solution to this issue. In-app update tool: provide a URL to a new version of the VIB, refresh the browser, et voila! Note that “drobo” is my datastore (visible by the host) and the ESXi600-201601001 is the uncompressed ESXi offline bundle folder. You might want to check How To Erase ESXi Disks With ESXi Host Client v3. 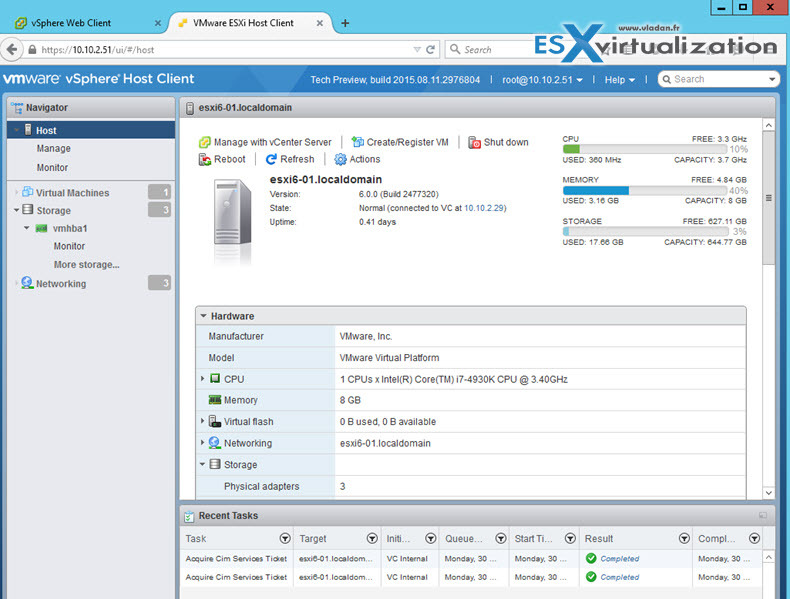 This is also a new capability of the ESXi host client! If someone have the issue with pt-br missing translate, i have made a workarround moving de directory do pt-br-default and create a new pt-br directory and copy the files from de en-us diretory to the new and refresh the interface. Thas works for me. Of course in English, but is fine now. can you give me more infos where the directories were stored? I’m falling to the same problem with german translation. Thank you for this tutorial, is it possible to make the esxi-host point the https://yourip direct to this web-client instead typing /ui in the end? I blogged about a script I wrote that will allow users to pass the cluster they want to add this to, into my PowerCLI script and it will install it for them automatically. is the ,vib file available for dowload via Vmware? I cant seem to find a dowload for it? An important thing to note is that the web client does not let you modify virtual machines if you have a license assigned. But hopefully it will be fixed soon. It’s The “best of the year” VMware utility so far -:). Does it work on the free version of ESXi? For people who are using the free ESXi licence Vmware provide this seemed a great alternative to the vSphere client. However it appears you can look only and not touch, basic things such as the ability to power a VM are not available to people with the free licence sadly. When using the web interface to edit an existing VM the changes are not saved, however i’m not sure if this is an actual restriction or just a bug. Likewise I can go through the motions of setting up a new VM, however this VM will never actually be created, again unsure if this is a restriction or bug. Anyway I guess that I shouldn’t complain as I can still use the core product for free at home, which for running my home nas, router, vpn and other misc vm’s it does perfectly. Thanks for this. Will definitely let you know how I get on. If I go through the VM creation process, it does not fail silently. I receive a message stating that the VM configuration was rejected. Is this really going to be a free tool for those of us not using it for business purposes or is there going to be licensing involved? I’m skeptical at the moment. Hi Stephan, i’ve got the same error today. 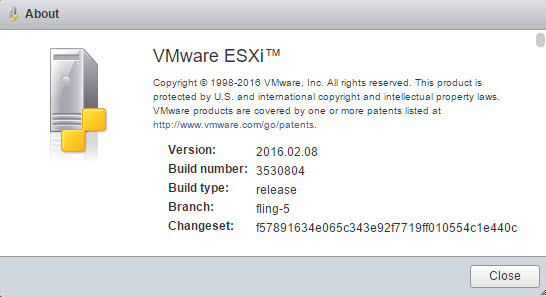 But it seems it’s due to the esxi version, i use 5.0.
esxui is vSphere host client “fling”. Aren’t you installing and there is an old version installed already? to see if this will automatically remove the old vib. If yes, then run the command again without “–dry-run”. Fantastic program! I discovered this last night as I was trying to find a way to expose hypervisor settings to a guest (I have to evaluate KVM) and it’s not in the vSphere Client – Workstation yes, vSphere client no so after a lot of searching I found out what to add to the vmx file manually. Afer I found that I found references to the web client and ended up here. I run a single ESXi server in my home/work lab to test setups and evaluate for clients so I’ve been using the vSphere client but it’s Windows centric as is vCenter (but that’s not in my current budet!) and my main workstations are Linux. At one point in my career I worked with VMware starting at 3 and going through 5 in an Enterprise environment with several hundred vms. This program blows the doors off the vSphere Client. VMware needs to dump the vSphere Client and use this. With this you can get to things that are hidden in vSphere such as exposing hypervisor to the guest machine. The only issue I have is the ones noted above that when you have the free license it doesn’t do anything! Hopefully that will be addressed soon. Keep up the good work and make this a standard part of the install so when we fire up an ESXi host this is usable out of the box! The installation went fine. But trying to access = https://192.168.30.4/ui, we are getting error = 503 Service Unavailable. But we are able to access = https://192.168.30.4 fine. We are able to access https://ipaddress Page fine. I had it working, then I installed a different DHCP server and started a new scope, which now my interfaces point to a different IP. When I open a browser as normal, I just get a white page. No errors???? I tried this from a couple of machines. I have uninstalled the VIB and reinstalled. I have not tried to reboot, as that takes forever with the # of VMs and we are running the server from a USB stick. Anyone seen this querk? Nevermind.. the URL is very finicky. I saved the URL as https:///Ui and it does NOT like that. Changed it to https:///ui anf working again..
working just fine using it from inside my network but can’t access it from outside even if i made rule nat on my router , what port did the ui use ? Any updates on if / when this may be fixed / implemented for free ESXi? I am confused : I use Esxi 5.5 Free licsense. I use normally vSphere Client v.5.5.0 windows to connect. It possible i use your solution web client? ps : In fact i did exactly and i got “503 Service Unavailable” on my browser…. Your statements are contradictory. When you say you’re using Free license (VMware Hypervisor) then you don’t have vSphere client. You are able to use vSphere client only in case you have put vCenter server in place, as well as the licensing which goes along. (example vSphere Essentials or higher). This VIB is destined mostly to ESXi free where admins do not have vCenter server. It’s a experimental utility (tech-preview) for now, but it shall be integrated in future version of ESXi. VMWare have so much products, its a jungle! I use this to install my server “VMware vSphere Hypervisor ESXi 5.5 VMware viclient 5.5.iso” (free license). Can I use the web client or…? Please advice. But if i open browser for https://myserverip/ui I got “503 Service Unavailable”. I also restart it but same result. If i type https://myserverip/ i see the normal esxi normal page. Hello I have the same problem (503 Service Unavailable). 2016-02-19T13:24:42.676Z [FFFD9B70 warning ‘Proxy Req 55272’] Connection to localhost : 8308 failed with error N7Vmacore15SystemExceptionE(Connection refused). There is a workaround for the “503 Service Unavailable”. Experienced the issue myself followed the steps and it’s working for me now. Thank you!! Just to clarify for some folks, IMO this web client is not a good replacement for the windows C++ client just yet IF you are using ESXi Free license since it is essentially read only in function. You cannot power cycle a VM, you cannot make any changes to the configuration… It works great apparently on licensed versions due to api availability in the paid versions? In any case, I hope that this will work one day for the Free licensed versions. It is planned to be made available from what I see though I’m not sure how this will be achieved considering the api is not accessible in the Free licensed version, but then that’s beyond my level of expertise… I really hope that we get full feature sets for Free licensed ESXi. Thanks to everyone who’s working on this. Hi Vladan and many thanks to your community support! Do you have install version 6.0 of web interface? The Know Issues list report again “On ESXi hosts which are assigned a VMware vSphere Hypervisor license, all modification operations will fail silently. We are working on a solution to this issue.”…..
Do you have any feedback about that? The next major release of ESXi will have this tool baked in. And free ESXi will be supported. Can anyone conform that for the latest ESXi 6.0 U2 update, using this webinterface client is not limited to Read-only like mentioned here when using a total Unlicensed/Free instance? I have today tried the Web Console on my ESXi Servers as we have just installed Update 2. We too experienced the “503 Service Unavailable” error and from this page found the resolution to this however we now get “Failed to Connect” when we try and use the console on the guests… does anyone know how to resolve this? Still bugs here and there (JS errors, asking for login/password again when opening console, occasional freezes and some stuff still missing) but looks damn good. We haven’t saw built-in web interface since like… days when ESXi was called ESX and it was based on RHEL? we want to use hypervisor for our small website. so, every user who requests demo / register , he will make vm . Why use supervisor , yea earlier. Let one person get one vm , but it is managed effectively. Works fine as it should be. Nice vmware vsphere host client web HTML5! thank you Vladan! Because i wasn’t able to manage hardware assisted virtualization to the guest OS with my vmware vsphere C# client, i needed to put vhv.enable = “true” to the VM’s .vmx file. Well done! Thank you for taking the time to document these steps. When i try to do any changes from the UI to either the VM or Host it will not run. I try to add usb controller on the VM and save and nothing shows in the Recent Task list. I also try to disable SSH that is still enabled on the Host and it won’t disable. 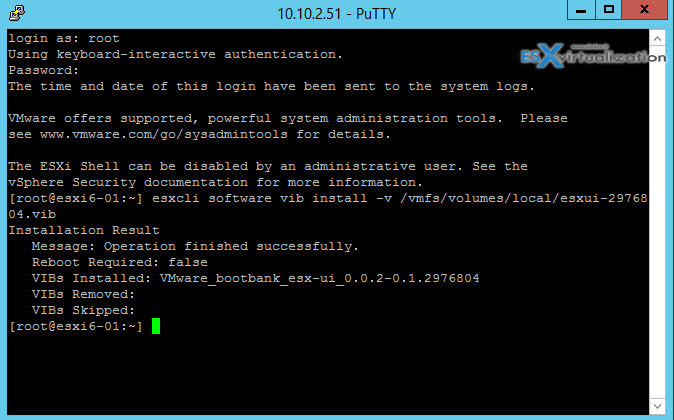 I installed esxiui-signed-9277095.vib that is the latest vmware provides. Any reason why I am unable to do any changes? Sorry, no idea why this is happening. Please note that this post isn’t new. By downloading the latest ESXi and doing an upgrade (if you aren’t running the latest release) you will automatically have the latest ESXi host client installed. (no need to install any vibs).